Cryoanalgesia is a specialized technique for providing long-term pain relief for various podiatric conditions. People have recognized the value of cold for analgesia for thousands of years. Hippocrates left us the first written records of the use of ice for pain relief. Modern Cryoanalgesia as we know it today was developed in the early 1960's. This technique is superior to other methods of peripheral nerve destruction (e.g. alcohol injections, phenol applications, or surgical resection) because it is not followed by neuritis or neuralgia. There are few options for successful relief from painful foot conditions. Surgical resection of the nerves often leads to recurrent nerve growths called neuromas. These neuromas are often more painful than the original problem. Narcotics do not treat nerve pain but rather only "mask" the pain. The Cryomed Corporation from England has developed the Cryostar. Over the past three years, its use for podiatric-related conditions has been extensively tested for safe, effective and proven pain relief. The Cryostar was FDA approved for use in podiatric ailments in June 2003. Since bringing this "state of the art technology" to the podiatric arena, only a select group of Cryostar Certified Podiatric Physicians are qualified and demonstrate the necessary expertise to treat these painful foot conditions. Your podiatric physician was chosen to be one of these select few. 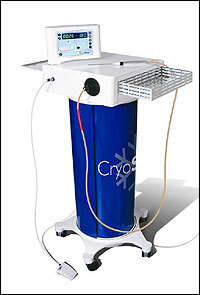 Cryosurgery is performed in the office of Dr. Kelly Oliveros. This minimally invasive technique takes 15 minutes to perform from start to finish. The painful area is infiltrated with a local anesthetic, so that the cryoprobe can be introduced without discomfort. A tiny puncture is made through the skin. Next, a small blunt instrument called a trocar is placed through the puncture site to create a portal for the Cryoprobe to be introduced. The probe is inserted through the puncture site and the Cryostar is set for a 3 minute freeze cycle, followed by a 30 second defrost, then another 3 minute freeze. The probe is then removed. An antibiotic ointment is placed over the puncture site with a sterile dressing applied. Sutures are not necessary due to the small size of the puncture. The dressing maybe removed within 24 hours and a shower is then permitted. The puncture site is to be covered with a small amount of antibiotic ointment and a band-aid. Postoperative discomfort is minimal. It is suggested that you decrease your normal level of activity over the first 48 hours. Your next scheduled visit will be within 3-7 days. Dr. Oliveros is one of four Cryosurgeons in the country to use the new Plantar fasciitis Probe. This probe makes a larger and longer iceball which enables her to effectively treat a larger area of the heel with more precision and accuracy. The company selected Dr. Oliveros as one of its top cryosurgeons and training centers to use this probe. The most common ailments I see in my practice are plantar fasciitis, heel spurs and generalized heel pain. Over the years many different treatments have been developed to try to eliminate these painful conditions. Cortisone injections, strappings, orthotics, and oral anti-inflammatories have had limited success. Even the newer surgical procedures such as endoscopic plantar fasciotomies, and ESWT (shock wave therapy) have not shown dramatic results. The Cryostar has been able to achieve results equal or better than these other surgical procedures, and at a much lower cost to YOU the patient. The Cryostar will allow me to provide the best possible treatment for any patient who suffers from heel pain. Morton's neuromas are another common podiatric condition. Symptoms present as pain commonly between the third and fourth metatarsals that causes numbness, tingling, burning, or shooting pains into the involved toes. Patients often experience the sensation of an electric shock in the ball of the foot. Pressure from ill-fitting shoes appears to exacerbate the symptoms. The term neuroma actually refers to a benign nerve tumor in the foot. Standard treatments such as cortisone injections and surgery have led to less than optimal results. The Cryostar is a more effective treatment option for these painful nerve conditions. It has also proven effective for patients who have undergone previous surgical treatment with recurrence of the nerve tumor. In my continuing quest to bring my patients the latest advances in treatment options for a wide variety of ailments, I have found that the Cryostar can be used to treat many other foot problems. Nerve entrapments in other parts of the foot such as Tarsal Tunnel Syndrome, can be treated effectively with the Cryostar. Management of diabetic peripheral neuropathy and painful osteoarthritis has shown promising results. Soft tissue tumors and plantar warts are a few of the other problems that can be treated with this technology. In the very near future, I plan to expand the use of this treatment modality to further increase the scope of foot problems I can treat with the Cryostar. Most insurance plans contacted by this office indicate that they provide varying degrees of coverage for this procedure. It is your ultimate responsibility to check with your insurance carrier for specific coverage exclusions or limitations. For insurance plans that we do not participate with, payment will be expected on the day that services are rendered.